At the end of the year I lamented that I didn’t feel like I got on my bike enough in 2013. I clocked in a total of 3,184.38 miles, which was exactly 1,815.62 miles less than last 2012 (in which I went out on New Year’s Eve to cap off precisely 5,000 miles). 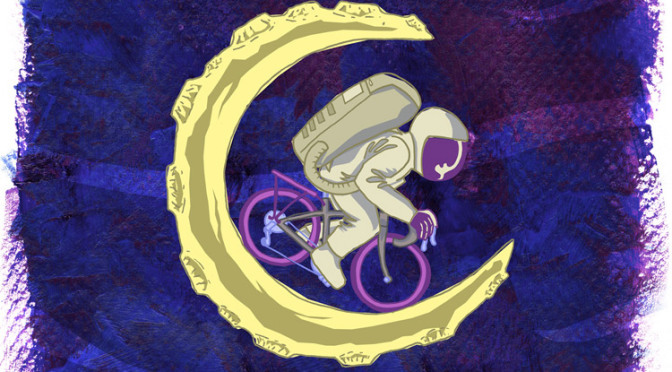 I’m not a person who makes resolutions (or rather, I don’t make resolutions on only one day out of the year), but my brother suggested I attempt to circumnavigate the moon by bike. 6,784 miles around the moon / 365 days in the year = 18.59 miles a day, which is over twice my average commute. Considering that takes about 15 minutes, this seems rather do-able. Even if I don’t make it all the way around the moon, hopping from crater to crater seems like a fun challenge for anyone. Plus, maybe there’s a chance to learn something, too. Using Google Earth, I’ve mapped a route around the moon. It’s about 10 miles over the circumference (riding landmark to landmark instead of as the crow flies), so I may tweak it slightly to get it closer to the true circumference. Or you can cheat and subtract 10 miles at the end. Or you can be a bullhead and insist on this exact route. Whatever. It’s just supposed to be fun. I imagine it would be fun talking with other co-workers about your progress. Edit: January 13, 2014: Added kilometers for all of my metric readers who know they’re on the right side of history. I also formatted the cue sheet into a table, where data belongs. Edit:January 14, 2014: If you’re on Daily Mile, you can easily track your mileage through the Lunar Cycle challenge. If you’re on Twitter, you can use the hashtag #LTFLunarCycle.